AdaFruit makes an adorable tiny little Circuit Python IoT device called the PyPortal that’s just about perfect for the kids – and me. It a little dakBoard, if you will – a tiny totally programmable display with Wi-Fi and lots of possibilities and sensors. Even better, you can just plug it in over USB and edit the code.py file directly on the drive that will appear. When you save code.py the device soft reboots and runs your code. I’ve been using Visual Studio Code to program Circuit Python and it’s become my most favorite IoT experience so far because it’s just so easy. The “Developer’s Inner Loop” of code, deploy, debug is so fast. 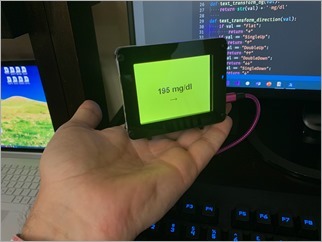 I use that REST API to make “glanceable displays” where I – or my family – can see my blood sugar quickly and easily. And today, on a tiny PyPortal device. The code is simple, noting that I don’t speak Python, so Pull Requests are always appreciated. I’ve put the code up at https://github.com/shanselman/NightscoutPyPortal. I want to get (make a custom?) a larger BDF (Bitmap Font) that is about twice the size AND includes 45 degree arrows ↗ and ↘ as the font I have is just 24 point and only includes arrows at 90 degrees. Still, great fun and took just an hour!